LourdesCare at Cherry Hill has received the New Jersey Business and Industry Association’s 2014 New Good Neighborhood Award, Cherry Hill Mayor Chuck Cahn and officials from Lourdes Health System have announced. Representatives from Lourdes accepted the award at a luncheon on Friday afternoon. NJBIA’s New Good Neighbor Awards annually recognize the best and most exciting commercial and industrial development projects throughout the state of New Jersey. The project was selected based on its economic benefit and job creation, architectural design, and community involvement. “We’re very proud that this project has become not just a beautiful landmark in our town, but a powerful engine of the economic revitalization and rejuvenation that’s going on in Cherry Hill,” said Mayor Cahn, who nominated the facility for the NJBIA award. Located at the intersection of Brace Road and Route 70, the facility opened in March 2013, transforming a long-abandoned “greyfields” site into the new face of healthcare: a state-of-the-art, one-stop ambulatory care center that services hundreds of patients from across South Jersey each day. The $20 million investment created more than 100 full-time, high-quality construction jobs. Each day dozens of medical professionals, including physicians, nurses and therapists work at LourdesCare. That additional investment includes a complete upgrade of the nearby Ellisburg Shopping Center, anchored by a new Whole Foods Market that is set to open on June 18. LourdesCare itself will expand its offerings this summer, with the opening of a new Urgent Care center. The Mayor credited months of close collaboration by a variety of community stakeholders – including Lourdes Health System, the Township, Camden County, and the developer, builder, architect, planner and engineer, for advancing the project from concept to ribbon-cutting in just 10 months, a daunting task in light of the project’s scope. 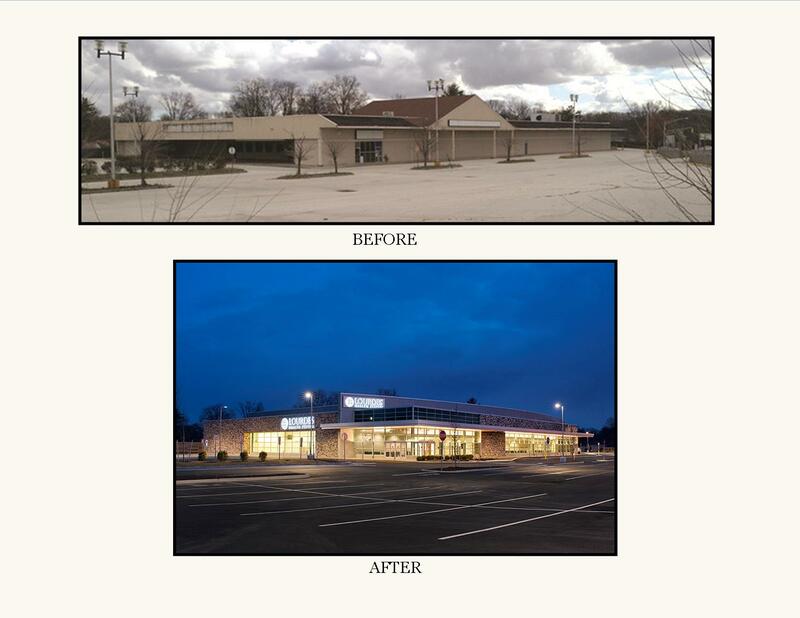 Structurally, nothing was left untouched: the facility underwent a complete interior and exterior renovation, and the site was enhanced with a significant reworking of site circulation, landscaping and improved stormwater design. Because of former uses at the site, including a gas service station and dry cleaning establishment, extensive environmental remediation was required. Constant soil sampling, ground water-testing, soil excavation, chemical monitoring, and underground storage tank removal transformed the site from a health hazard to health haven. For more information on LourdesCare, visit Lourdes Health System online at www.Lourdesnet.org.